“Maizee Hurd was an easy target for hard times,” according to Burdy Luttrell, the town healer. Burdy is a Melungeon woman with striking features and mysterious ways. She owns the land the Hurds leased following their marriage on June 3, 1940. Maizee moved upriver at the age of ten after tragedy struck, and she was sent off to be raised by a childless aunt and her doctor husband. Shortly after Maizee’s ferry boat arrival in the rural mountain community of Christian Bend—carrying only a small suitcase, her mama’s Bible, and her doll Hitty—the young girl began hearing the voices that would continue to torment her. It was the tender love of her husband Zeb and their shared passion for the Appalachian hills and rivers of East Tennessee that helped quiet the voices. But, as World War II tears through Europe, and Zeb prepares for deployment, Maizee’s life is rocked by the ripples of war. Despite the love that carried her through the birth of their son, Rain, and the boy’s subsequent illness that rendered him deaf, Maizee can’t silence the demons in her own head. The voices have returned with a vengeance and a plan. 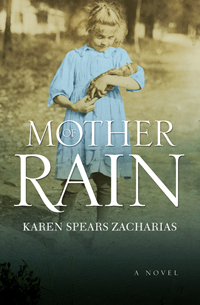 This is Zacharias's debut historical novel. It is availabe in e-book format at amazon.com and barnesandnoble.com.